From Bahrain Fort to Beit Al Quran, let’s take a walk through the history and the heritage of the kingdom by checking the most gorgeous historic buildings in Bahrain. 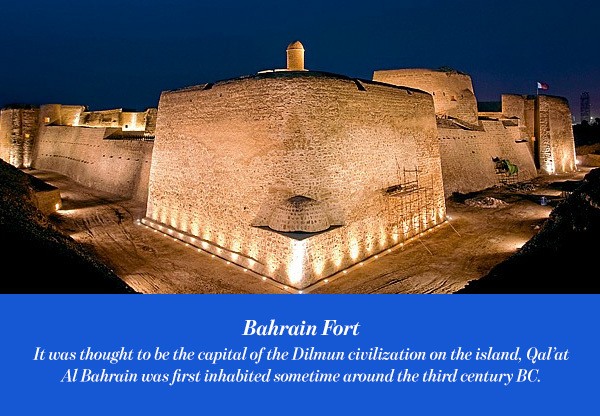 Aptly named The Pearl of the Gulf, Bahrain has got a very rich history. With its strategic position in the Arabian Gulf, Bahrain has been one of the essential commercial crossroads in the region for over 4,000 years. Additionally, the boom of pearls from Bahrain and the Gulf in world markets in the 1880s welcomed the modern age to the area long before the oil boom. The rich heritage of Bahrain spans over the years, to include historic and meaningful buildings. Buildings showing the rich culture of the country and how it evolved over the years. 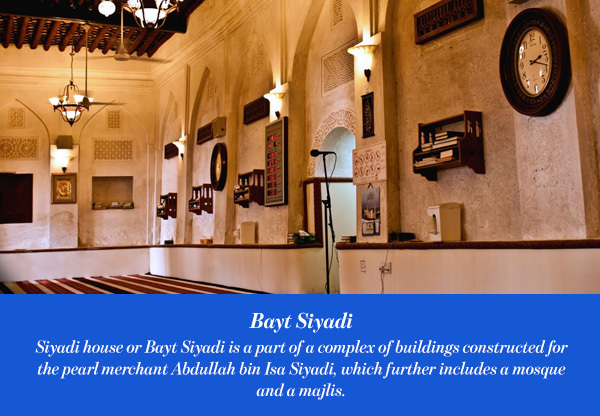 Siyadi house or Bayt Siyadi is a part of a complex of buildings constructed for the pearl merchant Abdullah bin Isa Siyadi, which further includes a mosque and a majlis. The oldest part of the complex is Siyadi Mosque, it is the oldest preserved mosque in Muharraq and is still used for daily prayers. The three buildings are perfect examples of the elaborate decorations of the late pearling era of Bahrain. Looking like a fort from the outside, while the inside is a wonderland of engraved walls and geometric design. The house has recently been restored and is one of the country’s historic highlights. At present the Siyadi Majlis is under the responsibility of the ministry of culture. The house is included in the “Pearling: Testimony of an Island Economy” project and was designated a UNESCO World Heritage Site in 2012. 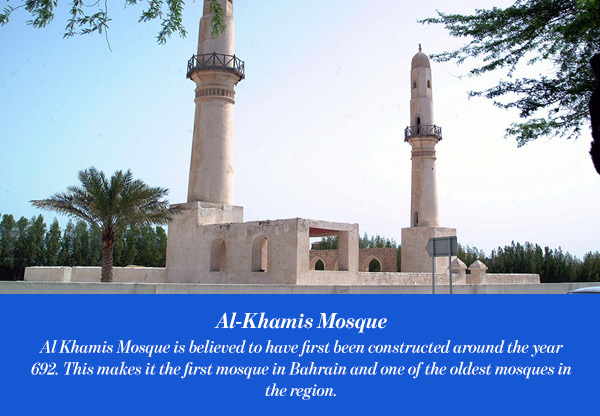 Al Khamis Mosque is believed to have first been constructed around the year 692. This makes it the first mosque in Bahrain and one of the oldest mosques in the region. The beautiful mosque is adorned with Kufic script and some faded murals and is one of the highlights of Islamic history in the Gulf. In addition to that, the twin minarets which distinguish the mosque was not built together, one minaret was said to be built 200 years after the first was built. The architecture of this mosque is one of the best you can ever see. The Khamis mosque has been rebuilt twice in the 14th and 15th centuries, and It has been partially restored recently. It was thought to be the capital of the Dilmun civilization on the island, Qal’at Al Bahrain was first inhabited sometime around the third century BC. The original site dates back to nearly 5,000 years ago, then later in the 16th century the Portuguese came along and built an impressive fort on top of the old ruins. The fort is located atop a 17.5 hectare artificial hill, and is registered as a UNESCO World Heritage Site. There is a very interesting museum situated alongside the fort as well, it has been open to the public since 2008. Located on Muharraq, Arad Fort was built in the typical style of Islamic forts during the 15th century. 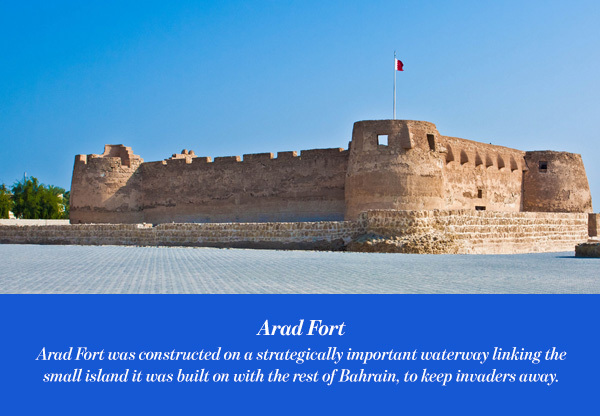 Arad Fort was constructed on a strategically important waterway linking the small island it was built on with the rest of Bahrain, to keep invaders away. After making extensive analysis of the original materials, the fort has been extensively restored in 1980. The fort is now one of the main attractions in Bahrain, it looks absolutely magical at night, when it is illuminated from all sides. 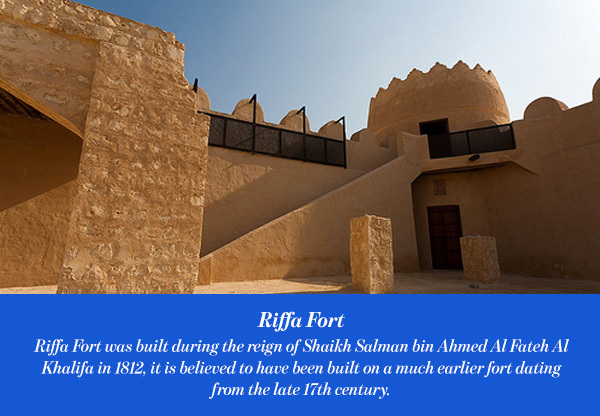 Riffa Fort was built during the reign of Shaikh Salman bin Ahmed Al Fateh Al Khalifa in 1812, it is believed to have been built on a much earlier fort dating from the late 17th century. The fort was home to the seat of government until 1869, and was completely restored in 1983. Riffa Fort now features three elaborate rectangular chambers, each with an independent court, there is also a huge facade on its northern side, a circular garrison amid the chambers, a well, and a mosque nearby. 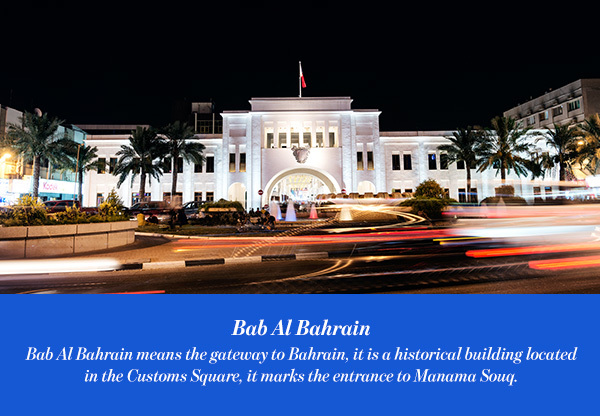 Bab Al Bahrain means the gateway to Bahrain, it is a historical building located in the Customs Square, it marks the entrance to Manama Souq. The monument essentially consists of a huge arch, below which runs a road, which is often referred to as the entrance to the souq. Built by the British in 1945, the building was originally designed by Sir Charles Belgrave. It was later redesigned in 1986, some Islamic architecture and design were added. Beit Al Quran is a multi-purpose complex devoted to the Quran and dedicated to Islamic arts in Hoora. 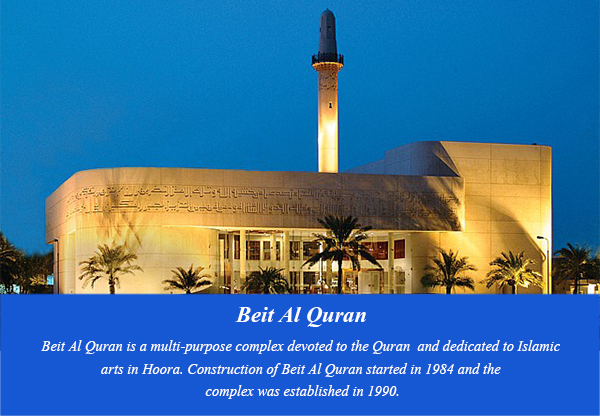 Construction of Beit Al Quran started in 1984 and the complex was established in 1990. The Islamic museum in Beit Al Quran, which consists of ten exhibition halls, is one of the most renowned Islamic museums in the world as it houses a globally distinguished collection of historic Quran manuscripts from different parts of the Islamic world. These ancient manuscripts represent the progression of calligraphic traditions over the years, from the first Hijri century to the present day. The exterior design of the building is based on designs of traditional 12th-century mosques. And the complex includes a mosque, a library, an auditorium, a madrasa, and a museum. A large stained glass dome covers the grand hall and mosque. The Mihrab is specacularly designed, it is covered in blue ceramic tiles with engraved Al Qursi verse. The establishment of Beit Al Quran was funded completely by public donations; everyone participated in funding this national project, from government officials to families to school children. And that is why all facilities at Beit Al Qur’an are free to the public.